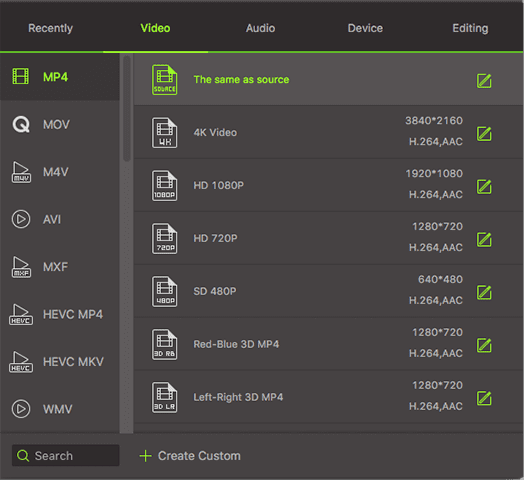 Why Do You Need a MP4 Codec for QuickTime? QuickTime can handle different video, sound and picture formats on Mac devices. It contains some of the popular codecs such as JPEG, DV, and MPEG4. However, you may find that it does not play some formats of MP4. This is because QuickTime only supports some of the MP4 video and audio codecs. Therefore, you may find that if you have MP4 files that QuickTime does not support, they will not play. This means that to play MP4 files that are not supported by QuickTime, there is a requirement to convert them to a supported format. You will need an MP4 codec for QuickTime. iSkysoft Video Converter Ultimate is the best MP4 codec that can enable playing of MP4 videos on Mac devices. 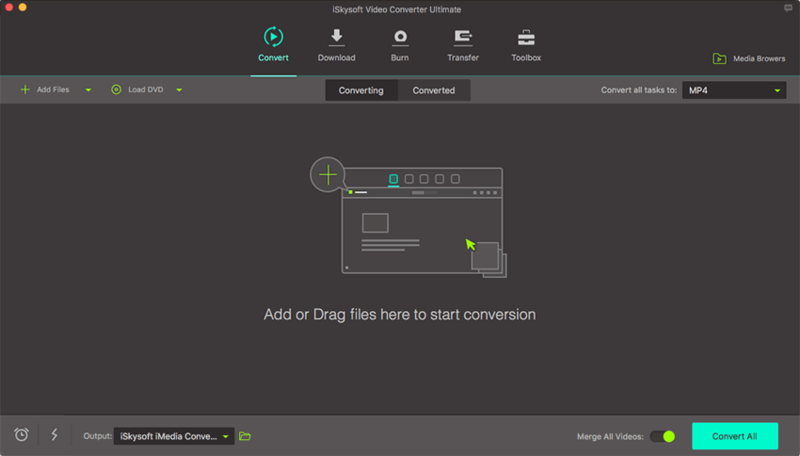 The converter is a tool used to convert videos and audio from one format to another. In this case, it can convert the MP4 files on your Mac device to a format that is recognized by the media player. Other than converting, the software can also be used for editing videos, burning DVDs and downloading audio and video files from various sharing sites. Convert MP4 videos to QuickTime compatible format with only three steps. It converts videos at 90 times faster while maintaining the original quality and it supports different input and output formats. Download online videos: It can download videos from various video sharing sites such as Hulu, Youtube and Facebook as well as convert them directly for use on the desired device. Burn MP4 videos to DVD, or copy your DVD file as a backup as needed. Edit your MP4 videos before conversion. Keep the original video quality after conversion. Perfectly compatible with macOS 10.7 or later, macOS 10.12 Sierra included. 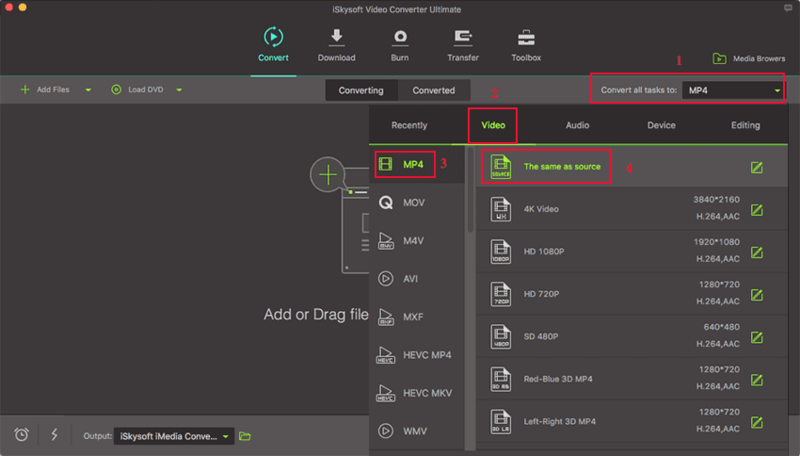 There are two ways you can import videos that you want to be converted to the program. You can drag the files to be converted to the window. 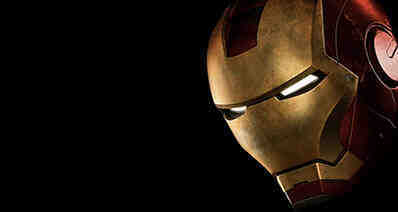 You should note that if you add a folder, all the files inside will be included for conversion. You can also hit the "Files" button and then choose "Load Media Files" to do this. Choose the output format you prefer and that can be played by QuickTime. The program supports more than 150 formats that are in six categories. Go to the right category and chose the format. Here, we recommend you to choose "MOV". Convert your file by clicking the "Convert" button. You will now get videos or audio that can be played using QuickTime. When the conversion is complete, you will get a message prompting if to open the folder. Convert Videos/Audios You can convert MP4 to various formats. Formats supported include AVI, MP4, MOV, NUT, NSV, WebM, MKV, M2TS, TS, VOB, MPEG-2, MPEG-1, MP3, AIFF, WAV, and so on. Download Online Videos Feel free to download your videos from websites such as Facebook and YouTube. You can directly download them within the program and then directly convert them into formats that you need. Video Editing The program provides you with various editing tools. You can crop, trim or rotate your videos freely. 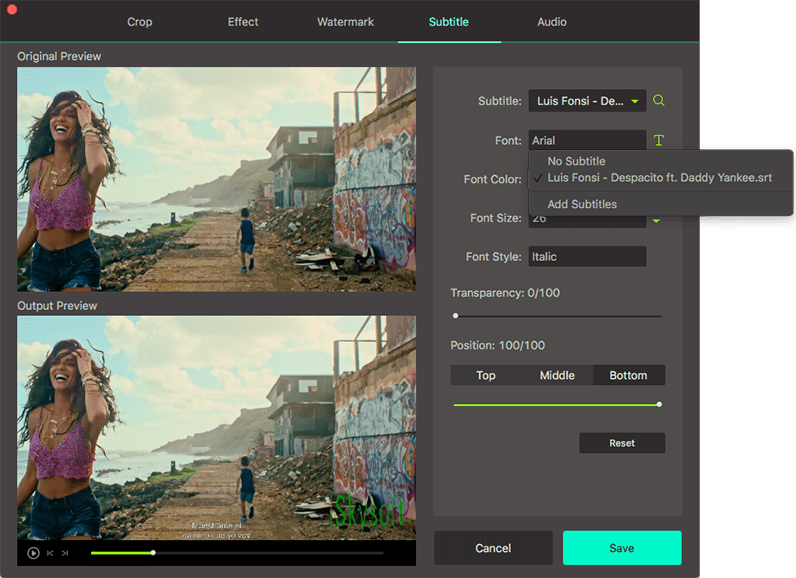 Moreover, you can also add watermark and subtitles to your videos. Burn to DVD You can burn your MP4 files onto DVD so as to enjoy them on big-screen TV. You can also convert your downloaded videos and then directly burn them to DVD.